This space wallpaper shows an artist’s impression of the surface of the distant dwarf planet Makemake. This space wallpaper shows an artist’s impression of the surface of the distant dwarf planet Makemake. This dwarf planet is about two thirds of the size of Pluto, and travels around the Sun in a distant path that lies beyond that of Pluto, but closer to the Sun than Eris, the most massive known dwarf planet in the Solar System. 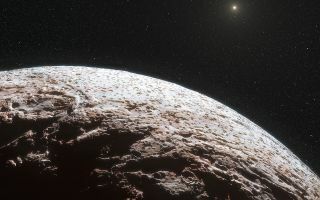 Makemake was expected to have an atmosphere like Pluto, but this has now been shown to not be the case.